Slightly lost in the hype surrounding the 2015 rookie studs like Kris Bryant and Carlos Correa, Jung Ho Kang put together a notable first year of his own. 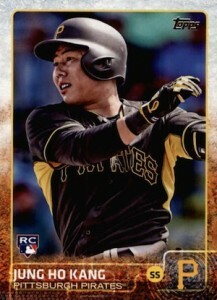 Although a late-season injury derailed his final push for an outside shot at some hardware, Jung Ho Kang rookie cards maintain good value and interest and he appears to have healed up nicely for the Pirates. 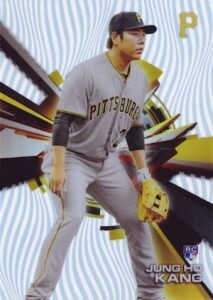 Shop for 2015 Jung Ho Kang autograph cards on eBay. Jung Ho Kang made his MLB debut in 2015, but the South Korean is a little older than many of the other MLB rookies as he spent nearly a decade playing in the Korean league. The five-time KBO (Korean Baseball Championship) All-Star signed with the Pittsburgh Pirates in 2015 after they won his bidding rights. Spending time at both third base and shortstop, Jung Ho Kang earned additional playing time in 2015 because of injuries to Josh Harrison and Jordy Mercer. He proven more than ready for the opportunity, posting a .287/.355/.461 stat line (BA/OBP/SLG) in his rookie season. He was also named the NL Rookie of the Month in July. While his late-season injury carried over to 2016, he is slowly being returned to the lineup and has played well in his limited appearances. Even without a multitude of rookie cards and a lack of traditional prospect cards, there are still plenty of options for Jung Ho Kang collectors. Signed rookie-year cards can be found in Stadium Club, Bowman Inception, Allen & Ginter, Prizm and Elite, among others. 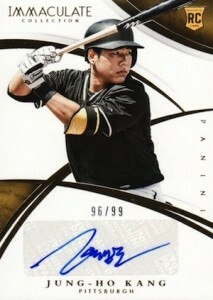 Although he is not part of the Topps Chrome base set, Kang has an autograph in the product. 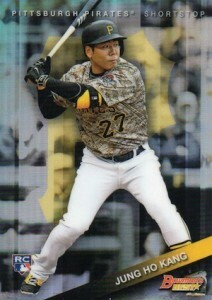 There are also some KBO cards from earlier in his pro career. 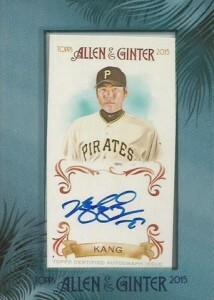 As the 2015 season came to a close, more products featured Kang but his autographs were issued as redemptions in many of the late-season releases. View all his rookie cards in one place with our detailed guide below. Click on the images or listings to shop for cards on eBay. Bolded sets in descriptions go directly to detailed profiles. With no Topps Chome rookie card to speak of, 2015 Bowman Chrome will have to suffice for chromium collectors. The basic card can be found for just a few bucks, but the higher values are reserved for the Refractor parallels. There is also a signed version of the card with another batch of parallels. Fundamentally similar to Bowman Chrome and Topps Chrome, 2015 Bowman's Best still stands out with the distinct background effect. The camo Pirates jersey also catches the eye. In addition to the base version, several Refractor parallels of varying rarity are available. 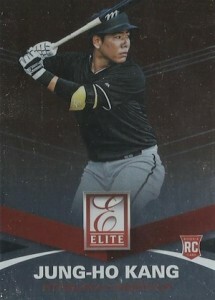 Unlikely to be a fan favorite given the lack of logos, the Jung Ho Kang rookie card in 2015 Elite is still relevant for collectors since there are simply not many official options. 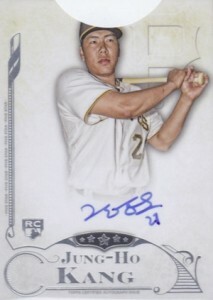 The generic jersey in 2015 Immaculate Collection gives it a less-desirable appearance, but the autograph sets it apart among Jung Ho Kang rookie cards. Adding to that appeal, the print run of 99 means that there are not too many floating around. One of several rookie redemptions for Kang, his National Treasures RC should command strong interest and decent value despite the lack of logos. The patch and limited print run adds to the appeal. 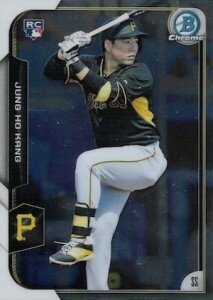 One of several key rookie cards in 2015 Topps Series 2, this Jung Ho Kang rookie will likely go down as one of his most popular base options. Featuring one of the busiest flagship designs of all-time, the card really stands out. 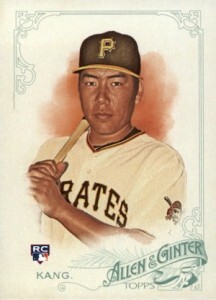 2015 Allen & Ginter offers a more familar look with Kang's rookie and the choices are greatly increased with multiple mini parallels. Perhaps most interesting to collectors, the Framed Autograph insert for Kang with on-card signature has proven very popular. Easily his most limited rookie card, Dynasty brings the ultra-premium to Kang's collectors. Limited to just ten copies, each card features a large patch and on-card autograph. Since his card was originally issued as a redemption, it was not known how many base versions there would be in total. Now that cards are live, it appears there are at least four image variations. Finally live, the 2015 Five Star rookie for Kang features an on-card autograph and a clean design. The base version is not numbered, but there are several tiers of numbered parallels. 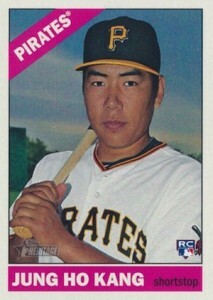 A simple Jung Ho Kang rookie card is found in the Heritage High Number release. The base card is joined by a Color Swap variation (on the right) that is more rare. Acetate meets a bevy of patterns in 2015 High Tek. In addition to the base Waves design for Kang, there are also more limited pattern options, including Pipes, Chain Link, Diamonds and Grid. The thick stock and acetate design makes Strata stand out among the Jung Ho Kang rookie options. Inserted into packs as a redemption, only select parallels (Green #/75, Black #/50 and Gold #/25) have emerged for Kang, making his one of the more limited rookie autographs in the set. 2016 ALLEN & GINTER JUNG HO KANG RELIC. 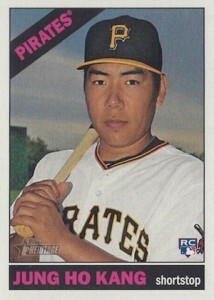 Pittsburgh Pirates. 2015 Heritage High Number also has a redemption for a Kang autograph card.